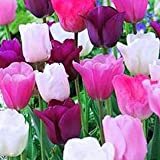 Tulip plant growing geophyte of the genus Tulipa also known, Tulip plant perennial deciduous used as ornamental plant, can grow in mediterranean, subtropics or temperate climate and growing in hardiness zone 3-11. Flower color can be: Red, pink, black, purple, orange, white, yellow or multicolor, in the beginning of the bloom the flower look like drop and it’s open. 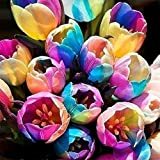 50 Fruit Punch Tulip Bulbs - Super-sized X-tra Value Bag! !